Poultry barns come in two forms. 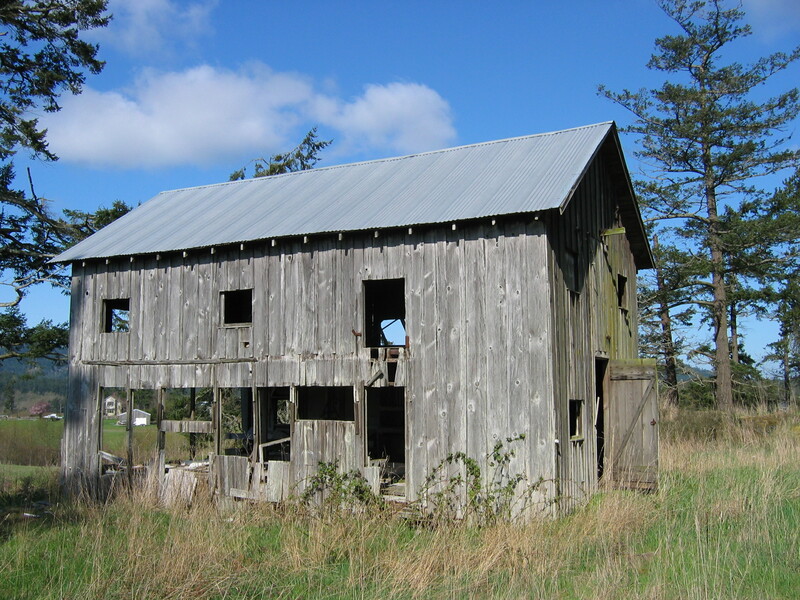 One is a two story, gable-roofed structure, with the lower floor used for coops, nest boxes, and roosts, while the upper floor is either empty (and used for ventilation purposes) or stores either grain or grit or both. The other form of a poultry barn has only one example, on Lopez. 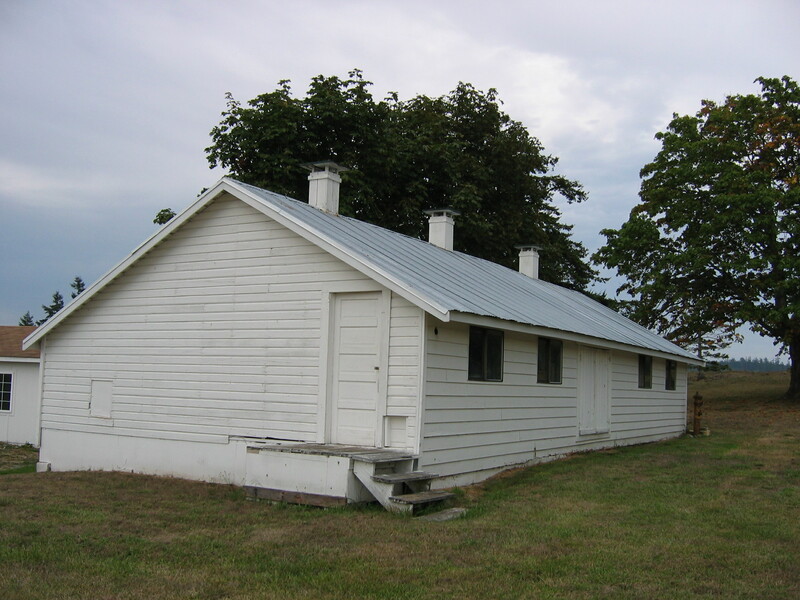 Constructed for turkey production, it is a two story structure with a monitor roof. The coops are on either side of a central aisle, and have wire netting. The monitor walls (clerestory) are louvered, so that the warm air and odors can rise up through the center section and be vented. In the center of building, at right angles to the center aisle, is a tightly-sealed granary at the second floor level. It is accessed by a gable dormer on the side, which allows for loading from along the side of the building. Poultry Houses. A more common structure on most farms in the islands was a poultry house, also called a hen or laying house or chicken coop. The aim of design for a good building as dry, clean, well-ventilated, roomy, warm during cold weather, and well-lit. Because hens are often moody birds, and particularly in regard to egg-laying are sensitive to the amount of daylight, it became important to provide artificial lighting in order to provide for laying throughout the darker winter months. Poultry houses were usually located nearest the house—because farm wives often took care of the birds—and also sometimes near the garden or orchard, where the birds could be let loose to hunt for insects. They were often one story and constructed of dimensional lumber and wood siding. The roof could be either gable or shed. Sometimes these long, low buildings, oriented along an east-west axis, had a ‘saltbox’ roof, where the higher façade faced south with large windows and the lower façade faced north with smaller windows or louvers for ventilation. One-foot-square ‘chicken doors’ opened onto slanted boards with narrow strips of wood nailed on so the birds could walk down to a foraging area or run, usually located to the south. People doors were usually located on the sides of the building. The plan dimensions depended upon the size of the flock; building manuals recommended 3-4 square feet per bird, so buildings ranged from 12’x14’ for a smaller flock of three dozen or so to 16’x32’ for twelve dozen birds. Narrow, “long houses” resulted from the addition of a series of pens or cribs in a row. 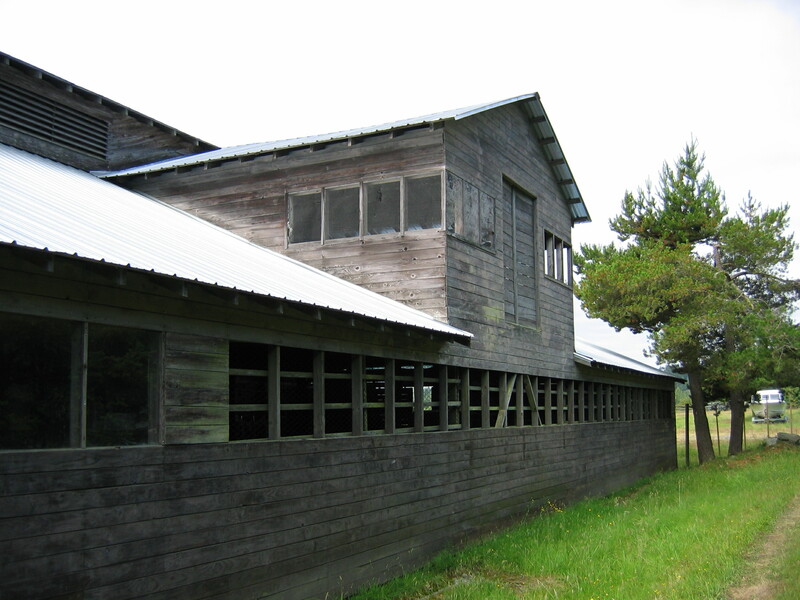 Inside, poultry houses featured several specialized spaces: a roosting area, where parallel strips of wood or rods offered a space for the birds to roost at night; rows of nest boxes; feeding and watering areas; and sometimes bins for dusting. In order to ventilate the houses of the strong odors and ammonia build up from manure, centrally-located ventilation shafts of 6-12” square ran from a few feet above the floor through the ceiling and out a ‘chimney’.